Fourth Row Center: Film Writings by Jason Bailey: On DVD: "The Two Escobars"
On DVD: "The Two Escobars"
I’ve never been a sports fan, but I never miss an episode of 30 for 30, ESPN’s anniversary series of original sports documentaries by filmmakers of note. 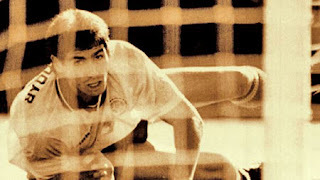 The resulting docs have been of such high quality that they’ve made the festival rounds and even seen some limited theatrical playdates; Jeff Zimbalist and Michael Zimbalist’s The Two Escobars, an ambitious dual biography of Colombian footballer Andrés Escobar and Colombian drug lord Pablo Escobar, is one of the best to date. The title characters weren’t related, but they were connected. Pablo, “the world’s richest criminal” (he was listed in Forbes) was heavily involved in Andrés’ team, the Atlético Nacional; he used it as money laundering operation, cleaning his ill-gotten drug gains. But he was also a fan (we’re told that he saw the team as a toy to play with, and would fly players in to his own field for high-stakes private matches), and he took his football seriously—so much so that many suspected he ordered the 1989 shooting of referee Alvaro Ortega in light of a controversial call. The Two Escobars moves smoothly between Pablo’s rise to power and Andrés’ rise to fame. The Zimbalist brothers have found a way to mate two of our most cinematic documentary subjects—sport and crime—and they get every ounce of vigor out of them that they can. The film is masterfully edited, full of tight, razor-sharp montage cutting (particularly in the sequences of Nacional’s winning streaks) and breakneck narrative; it just plain moves, knocking back and forth between the two men’s intersecting stories, from the lightness of power and fame to the darkness of disgrace and death. Colombia sails in to the 1994 FIFA World Cup heavily favored to win, with Andrés right on top—he has an offer from Italy and plans to move there with his fiancée to start a family. But in their first match, the team’s play is mediocre; their defeat is material but also psychological. There’s a darkness looming over them, with pressures ramped all the way up to death threats, when they take on the U.S. for their second match. “It is unthinkable for them to lose against the United States,” announces a commentator, but they do just that—and the primary cause is Andrés, who in an attempt to block a shot, accidentally knocks the ball into his own goal. By the time of that (shockingly) deadly mistake, Pablo Escobar was already gone, after incarceration, escape, and murder by the hand of his countrymen. “Things would have been different,” one of his underlings says, of what happened to Andrés after. “Pablo had rules.” This might be the case, though we can’t help but wonder if the film soft-soaps the ruthless kingpin just a touch; many mentions are made of his charitable contributions, how he was loved by the poor, built them houses, etc. And that’s all good and well, but let’s not forget how much of the world’s supply of cocaine this guy was responsible for (how he makes his money doesn’t get a whole lot of attention, despite the film’s slightly flabby 100 minute running time). Maybe Andrés would have met a different fate; or maybe Pablo would have lost a whole lot of coin because of Andrés’ slip-up, and been as angry at him as he was at that ref. The fates of The Two Escobars altered Colombian soccer; everything changed with the two of them off the scene. Without the steady stream of shady revenue, the Nacional couldn’t aggressively recruit and pay at the same high rates they once had. By 1998, the team had dropped from fourth to 34th in world standings. They haven’t played in a World Cup match since. But success comes at a price; as their coach notes, “We exchanged winning for our safety.” The Two Escobars examines that choice from the inside out, and the outside in. "The Two Escobars" is available now on DVD and Blu-ray. For full A/V and bonus feature details, read this review on DVD Talk. On DVD: "The Extra Man"
On DVD: "The Kids are All Right"
On DVD: "Best Worst Movie"